New in Sweden - Start a business! 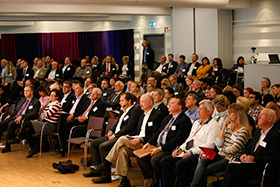 A brief introduction on how to start and run a business in Sweden. NyföretagarCentrum, The Education Swedish for Entrepreneurs (SFF) and governmental agencies, such as Swedish Tax Authority; Swedish Companies Registration Office and Swedish Agency for Regional and Economic Growth will give you a walk through the basics. Questions on how to start; where can I get help; where to register, will be adressed! We will start with coffee and a sandwich. Our treat! Aktiviteten arrangeras av NyföretagarCentrum, The Education Swedish for Entrepreneurs (SFF).